Shimla, March 26: It may well be a Jai Ram versus Sukh Ram poll battle for the Mandi Lok Sabha seat in Himachal Pradesh in the ensuing general elections, even though neither of them is actually in the fray. Former Union Telecom Minister Sukh Ram and Himachal Pradesh Chief Minister Jai Ram Thakur's prestige will be at stake in Mandi seat, which is going to the polls along with three other parliamentary seats of the hill state on May 19. The BJP has already renominated its sitting MP Ramswaroop Sharma, whose candidature was openly supported by Thakur despite Sukh Ram's grandson Aashray Sharma vying for the BJP ticket from the seat. With Sukh Ram joining the Congress along with his grandson on Monday, the Congress will most probably give the ticket to Aashray Sharma, a senior Congress leader told PTI. Mandi being the chief minister's home district, ensuring Ramswaroop Sharma's victory will be a matter of personal prestige for Thakur. 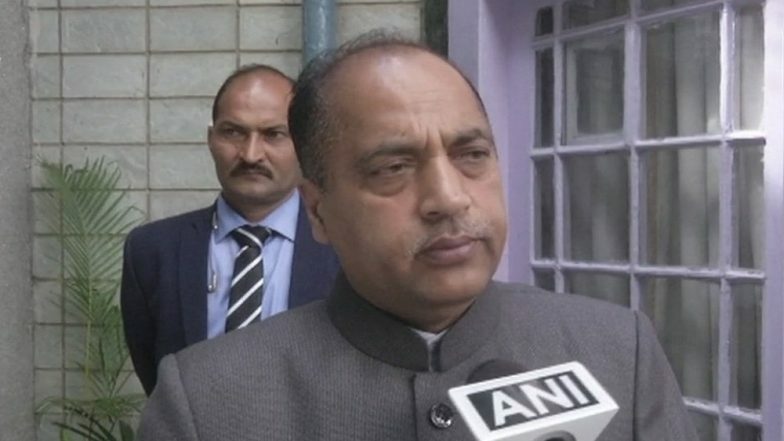 Himachal Pradesh CM Jai Ram Thakur Accuses Previous Congress Government of Making False Promises. On the other hand, Sukh Ram too will leave no stone unturned to get his grandson win this seat. Ninty-one-year-old Sukh Ram, the former Union telecom minister in P V Narasimha Rao-led Congress government, has represented Mandi thrice in the Lok Sabha -- in 1984, 1991 and 1996. Sukh Ram's grandson Aashray has already been electioneering in Mandi for weeks, even before joining the Congress. Sukh Ram, Former Union Minister, And His Grandson Rejoin Congress, May Contest Lok Sabha Elections 2019. "I have already campaigned in 15 out of 17 assembly segments except Seraj and Jogindernagar falling under Mandi parliamentary constituency," Sharma, 33, told PTI. Interestingly, Sukh Ram's son and Aashray's father Anil Sharma is currently the power minister in Jai Ram Thakur-led BJP government in the state. Sukh Ram joining the Congress along with his grandson has left his son Anil Sharma's political career in quandary. State BJP president Satpal Singh Satti told PTI, "It is up to Anil Sharma to decide whether to remain as minister or quit." Anil Sharma has been elected as MLA for four times so far and was also a minister during the Virbhadra Singh-led Congress government in the state from 1993 to 1996 and from 2013 to 2017. Sitting BJP MP Ramswaroop Sharma had won the seat by a margin of nearly 40,000 votes in 2014. He had secured 3,62,824 votes in 2014, defeating Congress candidate and Virbhadra Singh's wife Pratibha Singh, who had got 3,22,968 votes. Amid the prospect of the two Rams testing their electoral power in Mandi, this Lok Sabha constituency is set to become a hot seat in Himachal Pradesh.